I'm also using a sentiment clear stamp ("Love & Hearts Collection" 10pce set ); from Quietfire Design also available on Elizabeth Craft Designs HERE. And I'm using a Silhouette electronic file "Coffee-Break-Tag-Box"
Oh, my gosh! Those sentiments are perfect! I especially had to laugh at the "you're all mine", tee hee! 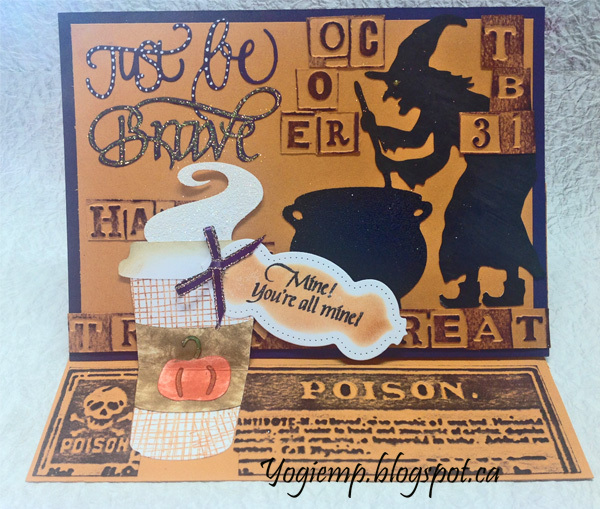 What a fun Halloween card, and combined with coffee -- perfect! I don't know what got into me this year, but I've made several coffee cards recently. Must be all the rain we're having. A real fun Halloween creation and such a nice design as well, many thanks for joining in with our Halloween theme at Allsorts this week. What a brilliant halloween card, love the images and the sentiments you have used. Thank you so much for sharing with us at Alphabet Challenge. Too funny, Yogi! Great card! The card is fun and fantastic for a coffee drinker. So glad you joined us at Die Cut Divas. So clever!This made me smile as coffee really is my 'poison'! Thanks for joining us at Crafty Calendar! Super fun card! Thanks for joining us at Make My Monday. Super easel card, great images and design. Lovely Halloween card with great images, thanks for playing along at Fab'n'Funky this week. 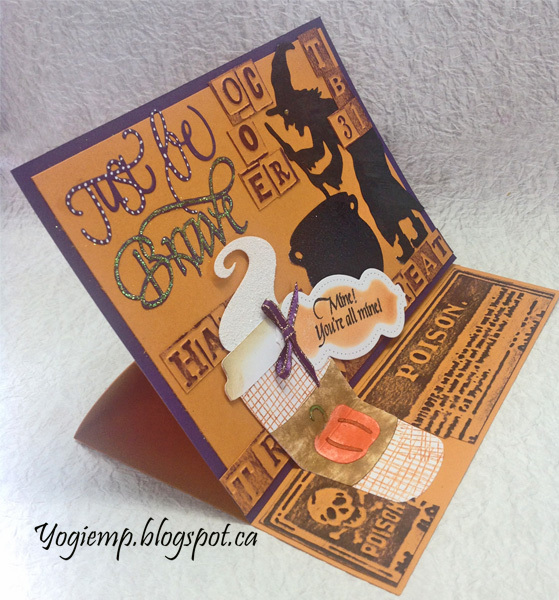 Wonderful spooky halloween easel card! Thanks for playing along with us at Frilly and Funkie Challenge! So coffee is your poison? LOL Very cute card! Thanks so much for joining the fun at the Frilly and Funkie "Tis Nearly Halloween" Challenge! This ticks all the Halloween boxes - great design. Thanks for joining in at City Crafter. What a great card you have made!! Great design work! Thanks for sharing this with us at Fashionable Stamping Challenge! A brilliantly spooky card for Halloween. Thanks for joining in the fun at Make My Monday. Happy Halloween. Caz DT. Wonderful spooky halloween easel card! Thank you for your lovely entry at Love To Scrap! Challenge Blog! Hope to see you again soon!! HUGS! A great atmospheric Halloween card! Such a spooky card Yogi and I love the atmosphere it creates when looking at it.